Building codes distinguish between cooking processes that create smoke and grease ( e.g., frying, charbroiling or griddling ) and those that produce only heat and moisture (e.g., steaming, baking and dish washing). Cooking that produces smoke and grease requires a Type I Hood, commonly referred to as a grease hood, which includes liquid tight construction, liquid tight exhaust duct and an automatic fire suppression system. Operations that produce only heat and moisture requires a Type II Hood, commonly referred to as a heat or condensate hood, which does not require liquid tight construction, liquid tight duct work or a fire suppression system. Grease hoods are typically constructed of 430 or 304 polished stainless steel, liquid tight construction complete with baffle type grease filters and a grease trough with removable grease cup. There are several styles of grease hoods with varying construction features. 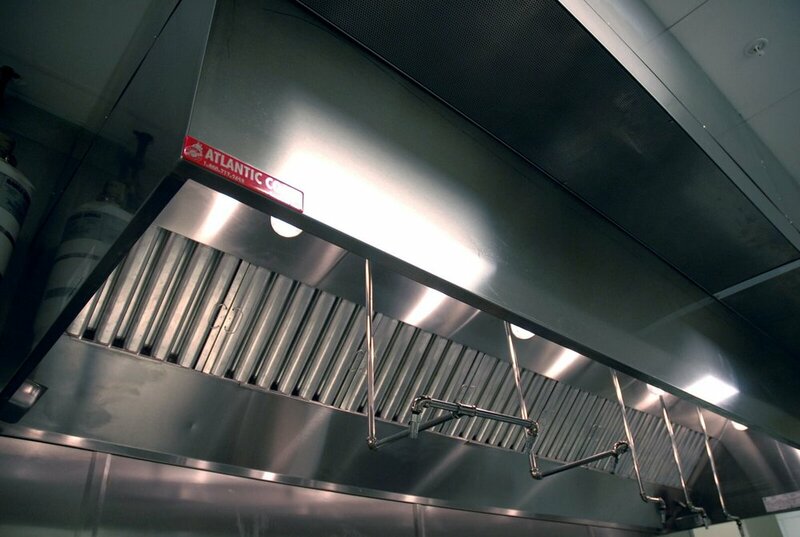 Wall mounted canopy hoods, island ( single or double ) canopy hoods and proximity ( back shelf, pass-over or eyebrow ) hoods all have different capture areas and are mounted at different heights and horizontal positions relative to the cooking equipment and listings. Grease exhaust ducts are to be fabricated of min. 16 gauge steel or 18 gauge steel welded liquid tight, per code. Atlantic Coast Restaurant & Mechanical Services chooses to fabricate our exhaust ducts from 16 gauge galvanized steel because we have found it to be superior to regular steel and ultimately a better product. Our exhaust ducts are specifically designed to meet the needs of our clients and vary from project to project. All duct work is designed using computer aided programs, cut out of sheets using plasma cutting systems and formed using machinery. Heat hoods are typically constructed of 430 or 304 polished stainless steel. Heat hood exhaust ducts are typically fabricated of min. 26 or 24 gauge galvanized steel. Heat hood exhaust ducts are typically fabricated of min. 20 gauge stainless steel welded liquid tight, due to the nature of a condensate hood and the conveyance of water vapor. We do not want the duct work to leak or rust. Supply ducts, for most typical hood systems, are typically fabricated of min. 26 or 24 gauge galvanized steel. There are two typical types of exhaust fans for the removal of grease laden vapors. An upblast exhaust fan which is typically found mounted on rooftops or walls and a utility set exhaust fan which is typically used inline or on rooftops. Upblast fans are constructed of aluminum, whereas utility set fans are constructed of steel. Both are acceptable for the removal of grease laden vapors, just used in different types of installations. Listed hoods have been tested against a recognized standard, such as Underwriters Laboratories (UL) Standard 710. Standard 710 dictates materials and design requirements similar to those in the building code and it has a performance test requirement for capture and containment of the thermal plume. Unlisted hoods must meet the prescriptive materials and design requirements of the local building (FBC) and health codes. In addition they must be operated at exhaust rates dictated by the local building code (FBC). Supply fans are designed to bring back approximately 80% to 90% of the air being exhausted. There are two typical types of supply fans used in bringing back or introducing air back into the kitchen. The typical box style fan is typically found mounted on rooftops or walls and an inline fan, typically used inside the building. Fans are typically constructed of steel or aluminum boxes with a blower and motor section mounted inside.